Sometimes there is a complicated maze of runs, with blues and reds intersecting and one can get them mixed up. I have not done research on what's out there, but I think one can get apps for some resorts which show the piste map and show where you are on it. But how do people do this? You can't really stop and check the map on your phone while slowly skiing? Or do people do that? They flipping well drive doing it so I bet some do. It's not something I get stressed about unless I'm with a Beginner/Early Intermediate. I get a rough idea of where I want to go and follow the run signs. If I take a wrong turn, then I take a wrong turn. If I'm with someone who is nervous, I will generally suss out the terrain before I take them on it and find out where their Instructor has taken them, if they have one. If I was worried about myself, I would take a lesson so as to get to know what I could handle and get a layout of the land....as well as read piste guides and speak to people who know the mountain eg. Resort Reps. In a new resort I can occasionally spend the odd minute or ten skiing very slowly around, paper piste map (not App) in hand until I get the hang of stuff - but generally unless you have a very nervous or novice skier/boarder with you (or are one) it's not usually a problem, most runs are well-enough numbered, and most of the times there's either an intersecting route back if you get on the wrong run, or at worse you realise you're on something too steep pretty quickly and pull over, unclip and walk back to comfort and safety. Or else get on with it, get down the run by hook or crook, and call it a learning experience one way or another. Stop, look at map, continue skiing. I don't know how you get reds and blues mixed up - they have at least one set of coloured markers down the side. The mistake I sometimes see people making is that they will look very similar in gradient at point of convergence sometimes and while that may be true over most of the length the red will have a steeper pitch or pinch point or whatever relative to the blue. I recognise that even quite bright people can have map illiteracy but I always feel its a bit of a waste to hire an instructor specifically to be a humN piste map. Me too. I do try to be aware of my surroundings and the signs so that the paper becomes largely irrelevant quite quickly. just head towards a cafe or lift & decide from there! SnoodlesMcFlude has it right. Keep skiing. Don't sweat about which color piste you are on. All pistes are white. I can rarely tell the difference between blues and reds anyway. @peter_h, I don’t think frequently referring to a phone is convenient when skiing. In decent conditions, in most developed areas, navigation by signs and occasional reference to piste map is easy enough. At complicated intersections there’ll usually be someone to ask if in doubt. Navigation can change dramatically and swiftly in low visibility. Then it’s easy to go somewhere you didn’t intend, even in areas that are very familiar. Preparing and planning your route, especially on low vis days, is important. Maybe phone apps useful as a back up in case of problems? You are only going the wrong way if you are going uphill. There is no need to review a phone map as navigating a modern ski area it not hard once you have reviewed the paper map and have a general mental picture of the ski area, it’s sectors and landmarks. Navigating can be tricky if caught in a whiteout - in that case slowly work your way down keeping the piste signs with the orange marker on the same side. Never wander off piste if you are lost even if it looks like a way back. Most modern resorts are posted with directional arrow signs at intersections and there are also numbers on the colour sign marker alone the piste which count down your progress down the hill in descending order to give you an idea of how far to go. When unfamiliar with an area I normally review the big billboard piste map at the top of the main lifts, look the big ‘You Are Here’ arrow and plan my skiing from there. You can also activate Live Location on whatsapp if you want others to know where you are. Of course it is...unless like the OP you are having lessons anyway and so can quiz the Instructor (which is why I made the suggestion). @peter_h, just lookout for the crowds of 5 year olds. they tend to be cluttering up blue runs. so as long as you aren't running over any of them, you're fine. would disagree on a large ski domain. No so much the aspect of getting lost, but more towards making sure enough time is left so you can make it back to your start position, rather than finding yourself on the wrong side of a mountain or even different country & expensive taxi ride home! I find that if I'm relying on someone else for navigation, it takes me twice as long to learn my way around as I'm not generally paying that much attention, but looking at a map in the evening can help fix it in my head. Otherwise it takes me 2-3 days to get the lay of a new area, with regular checks of the map and signage. After that, I mostly ignore the piste colours unless I'm looking for something specific, and navigate by lift names and points of interest as marked on the piste map in my head. This means that even in a white-out, if I can find a signpost I can find my way. @Mr.Egg, Agree with you re large areas like PDS. It’s better to use the local piste map produced by each ski locality (Morzine / Chatel etc) as they are much easier to follow. When I ski in a resort I'm not used to then on the way up i look at the Piste map (paper or on phone) mentally noting where the "tricky bits" are, at these bits I slow down and look at the signs which in the vast majority of resorts are quite good showing where each piste goes. It's like if I'm driving from London to Manchester, I'd look at the map and see I go up the M1 and after a while turn left on to something called the M6, I'd set off quite happily and then when I get near the point where I seemed to remember the M6 being I'd look for the signs! Rarely get lost on the Pistes or Motorways! Use the paper map they give out in resorts when required. They are free and useful on occasion. I met a group of people on the Slopes in Alta Badia who were genuinely lost. When i got out my map to show them where to go (looking for the Sella Ronda circuit) they literally had no idea you could get paper maps?!? They were not beginner skiers either!! Wrong! If I'm skiing around in a rush to make last lift then my plan has been executed perfectly. One of the best times of day to ski, with the pistes/lift queues empty and the sun setting, with the frisson of excitement that comes with knowing you may have pushed your luck too far. 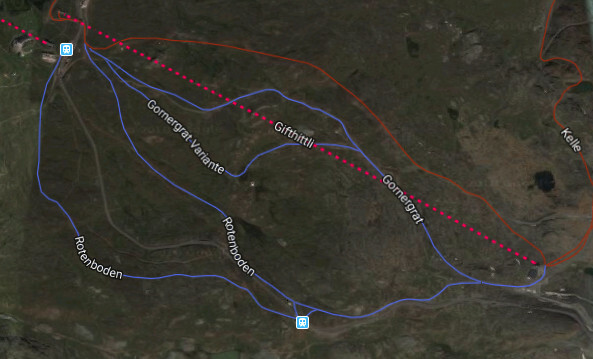 @peter_h, most of the apps that I've seen just give you the piste map (or version of) on your phone. They don't do navigation directions as a car satnav does. So you still have to stop and look at it. Unless conditions are poor I find the paper map better. I prefer fold the map do the area I'm in can be seen without completely opening it up. Have a glance and make mental notes at the top then use that and the signs. You should be sat in a bar with a pint by 4pm - enjoying the sunset from there. @WindOfChange, I can sit in bars and look at any time of year, there’s a limited number of days that I can ski. @Timberwolf, not really. Closest I came was having to ask the lifty nicely, but I also knew I could’ve caught a cab. SillySkier and someone else got caught in the Orelle valley at the EoSB a couple years back so had to get a hotel room. I’ve skied with her since and we’ll still push for last lift. "most of the apps that I've seen just give you the piste map (or version of) on your phone"
OK, yes, the apps I saw (not recently) were just the piste map, and that is not only almost never north-up but is usually severely distorted. But for general orientation a Google map is much better e.g. Is your head faulty? If you aren't on the first lift and last lift every day you are wasting your time. @Jonny996, makes a good point. Try and keep the phone in your pocket or else you could end up without it. I always carry my piste map in my pocket and look at it to check. OH and kids think I am dull but hey I like to know where I am. Only issue I have these days is that in ski in my contacts and so the kids have to now hold the map at arms length - oh the shame. Can't be arsed with bi-focal lenses either. Fine. Each to their own I guess. I don't understand your approach to this risk vs reward situation. If you were with children, less able skiers, tired skiers, I'd hope you had a different stance ? it's just not worth it IMO. Actually, you could do a lot worse than ask on here about the most suitable runs of your chosen resort. Then spend a bit of time studying the map. Paper map that I pre-fold to hide all the ads and show just the bit of interest. Don't need to swipe to unlock or do face/finger recognition, and the battery doesn't go flat either. Except in Sella Ronda, where you can ski just by following the sign posts to where you want to go. If you insist on using a phone to interact with the world and surroundings, then Google Maps is often not very up to date, especially where lifts are upgraded and moved. OpenStreetMap derived maps tend to be a bit more up to date (eg openpistemap / openpistemaps - one of them, forget which exactly, has usable interaction for pistes/lifts). eg. in the Sella Ronda, Google Maps still has the old Piz Seteur lift that was removed before last season. OpenStreetMap has the new lift and associated pistes, and was there for at least 10 months (ie the update was completely committed around opening day last year). Google still doesn't have Arabba Fly lift, and that's been there for at least 2-3 seasons now? An app can only be as good as the data that feeds it. However I do use paper when skiing.